On behalf of GDD and Meria Shantez, we would like to thank you for your generous donation of $40 to our #KingzKidd’s Care Bags Outreach. We are excited that you have decided to partner with us. 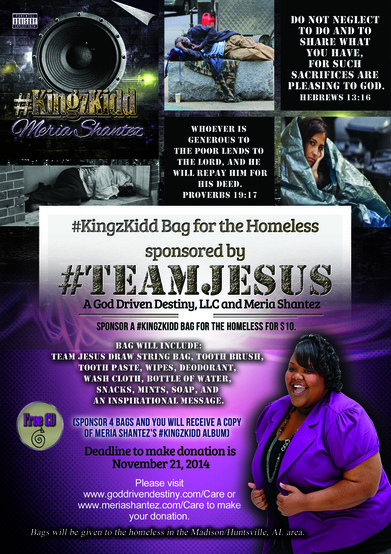 Because of your generous donation we were able to give 100 #KingzKidd Bags to the those who are without homes and shelter in the Madison/Huntsville, AL area on 23 Nov 14.